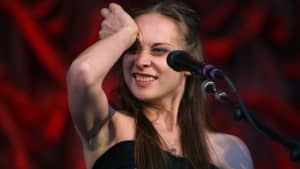 TMZ recently approached Fiona Apple while she was at the airport to talk to the singer-songwriter about the Time's Up movement. As far as sexual misconduct within the music industry is concerned, Apple's candid reaction suggests that the reckoning has been a long time coming. In regards to musicians wearing white roses on the red carpet at the Grammy Awards, she fully supports her fellow creators. "Everybody should express themselves however they want," she said. "They should wear whatever they want symbolizing whatever they want. Time has been up for awhile." However, Apple could care less about the fact that she is a Grammy Award-winning artist herself. In fact, she admitted that she doesn't even know where her 1998 award is for Best Female Rock Vocal Performance. "I don't know where it is at this point," she added. "I gave it away." Needless to say that there's no persuading Apple into watching the ceremony tomorrow night. "I just don't care," she said. "It's fine if other people care, it's wonderful. And I root for people, but I don't care."